Today, we take for granted the availability of global high-capacity communications circuits. Satellites and cables bring us information and entertainment from almost anywhere. It was not always this way. In the mid-1950s, for example, transatlantic communications relied on several teletype cables, a few dozen voice channels via cables equipped with vacuum-tube repeaters, high-frequency radio (roughly three to thirty megahertz), and the physical transport of messages by plane or ship. The rest of the world was not even that well equipped. The high-frequency medium always has challenged communications engineers. Under favorable conditions, it provides global point-to-point communications by using relatively small, low-power transmitting and receiving equipment. However, natural phenomena often interfere with high-frequency links, and during war ("cold" or "hot"), they become targets for jamming. Nevertheless, high frequency was the only game in town in the 1950s. As a result, communications for the command and control of U.S. strategic forces worldwide were lacking. The goal of the space communications program of Lincoln Laboratory at the Massachusetts Institute of Technology (MIT) was and remains the development of reliable, affordable systems of military communications. The program's initial objective simply was to make long-range military communications routinely available--first for large, fixed terminals and then for small, mobile ones. After that objective was reached, the emphasis shifted toward making communications systems capable of functioning, despite the most determined efforts by an adversary to interfere with them by jamming or by physical attack. The immediate impetus for Lincoln Laboratory's first work in space communications came from the HARDTACK series of high-altitude nuclear tests carried out in the Pacific Ocean near Johnston Island in August 1958. The first detonation destroyed the ionosphere over a vast area around the test site and interrupted many high-frequency radio communications links, because high-frequency radio signals travel by reflecting off  the lower surface of the ionosphere. In particular, the loss of high-frequency radio halted commercial transpacific air transport. The military implications of a high-frequency radio communications failure at a critical time were obvious. Walter Morrow, at Lincoln Laboratory, and Harold Meyer, then with TRW, considered the problem of high-frequency radio communications failures during the Army's Project Barnstable Summer Study in 1958. They suggested that if natural phenomena, such as solar storms, or thermonuclear detonations disabled the ionosphere as a radio reflector, then an orbiting artificial reflector could replace the ionosphere. Just prior to this, both the Soviet Union and the United States had demonstrated the ability to place satellites in orbit, so the idea seemed feasible. Morrow and Meyer proposed creating an artificial ionosphere consisting of a pair of belts (one circular polar and one circular equatorial) of resonant scatterers in orbit a few thousand kilometers above the Earth's surface. The scatterers in each belt would be conducting lengths of wire that would resonate at the system's operating wavelength and therefore reflect radio signals--the smaller the wires, the shorter the wavelength, and the easier their distribution from an orbiting dispenser. If the wires were too small, designing adequate transmitters and receivers would become excessively difficult. Subsequently, Lincoln Laboratory proposed an experiment to demonstrate transcontinental communications by sending full-duplex (that is, simultaneously in both directions) transmissions between terminals in Camp Parks, California, and Westford, Massachusetts. The orbiting wires would act as half-wave dipoles and resonate at about eight gigahertz; communications would be transmitted at 7,750 and 8,350 megahertz. Each scatterer would be a 0.7-inch (about 1.8-centimeter) length of #53 AWG copper wire (0.0007 inch, or about 0.0018 centimeters, in diameter). The experiment required that about 480 million of these forty-microgram dipoles (nineteen kilograms of copper total) be distributed into circular polar orbits at an altitude of about 3,600 kilometers. The average separation between dipoles would be roughly 0.3 kilometer. Lincoln Laboratory unveiled Project West Ford in 1960 in virtually complete detail, even though the planned experiment was originally secret. It was particularly important to allay the concerns of optical and radio astronomers and other scientists who perceived the experimental belt as potentially harmful, causing interference with scientific observations and auguring worse experiments to come.3 The experiment originally bore the name Project Needles, and renaming it Project West Ford did little to still the clamor from both sides of the Iron Curtain.4 Ultimately, reason prevailed, and presidential approval was given for Project West Ford launches, although limited to the bare minimum. Project West Ford was an undeniable success, but it had little impact in terms of operational employment. Communication via passive satellites, such as the West Ford dipoles, required users to make large investments in complex terminals and provided only limited capabilities. The success of active communications satellites, beginning with AT&T's Telstar 1 in 1962, swept the field. Now and then, though, the vulnerability of conventional satellite communications to radio-frequency interference, whether intentional or not, is brought forcibly to everyone's attention. Furthermore, most satellites in orbit are fragile and thus vulnerable to physical attack. Therefore, Lincoln Laboratory has focused its work in active-satellite space communications on the development of robust systems that function reliably in the face of formidable levels of interference. However, the lesson of Project West Ford--that point-to-point scatter communications at limited data rates can be extremely survivable--should not be forgotten. Following Project West Ford, Lincoln Laboratory embarked on a program to improve the design of active satellites. In most cases, the downlink signal (from a satellite to a surface terminal) is the "weak link" in satellite communications. An uplink can be strengthened by increasing the power of a surface transmitter. In contrast, a satellite downlink must be strengthened by accomplishing a more difficult task: the maximization of the effective isotopically radiated power per unit mass in orbit. To address this downlink problem, Lincoln Laboratory set out to develop high-efficiency spacecraft transmitters in the downlink frequency band. Improved antennas offered an additional benefit. If the spacecraft attitude-control system linked to a high-gain spacecraft antenna could position the antenna within the required beam-pointing range, both downlinks and uplinks would benefit. A series of Lincoln Experimental Satellites (LES) launched between 1965 and 1976 addressed these and other spacecraft-related technological questions. High-efficiency systems of modulation and demodulation, together with recent advances in encoding and decoding signals for detection and correction of errors, promised significant advantages for communications terminals. Also needed were interference-resistant, multiple-access signaling techniques that permitted the simultaneous use of a satellite by tens or hundreds of users, some of them mobile, without involving elaborate systems for synchronization and centralized control. These and other terminal-related problems were addressed by a series of Lincoln Experimental Terminals (LET) that went hand in hand with the LES. Lincoln Laboratory's space communications program after Project West Ford began in 1963 with a charter to build and demonstrate military space communications systems.6 The initial program objective was to build, launch, and field a LES and a LET that would work together as a system and demonstrate practical military satellite communications. The availability of Project West Ford's advanced superhigh-frequency (SHF) technology (at seven to eight gigahertz) contributed to the decision to design LES-1 and LET-1 for that band. The Department of Defense's concurrent procurement of a series of SHF satellites and terminals, commencing with the Initial Defense Communications Satellite Program (IDCSP),7 meant that lessons learned from LES-1 and LET-1 would find an additional application. LES-1, launched from Cape Canaveral on 11 February 1965, accomplished only a few of its objectives. Apparently because of miswiring of the ordnance circuitry, the satellite never left circular orbit and ceased transmitting in 1967. LES-2, the twin of LES-1,8 fared much better; it achieved its planned final orbit on 6 May 1965. The operation with LET-1 9 was successful and commenced the morning after launch. The next step in Lincoln Laboratory's program in space communications was to park a satellite in geosynchronous orbit. LES-4 was built to fulfill that mission. The satellite was an outgrowth of LES-1 and -2, but it featured more solar cells and a larger array of Sun and Earth sensors.10 LES-4 carried an instrument for measuring spatial and temporal variations of the energy spectrum of trapped electrons encountered in orbit. This instrument was added to provide information both for scientific interest and to aid the design of future spacecraft. A Titan IIIC booster was to carry LES-4 and its companion, LES-3 (described in the next section), to a near-geosynchronous altitude and deposit them in circular, near-equatorial orbits. Unfortunately, the booster failed to finish its job, leaving these satellites stranded in their transfer ellipses. This disappointment, however, had its bright side. LES-4's repeated trips between perigee (195 kilometers) and apogee (33,700 kilometers) gave it many opportunities to measure the radiation environment over a wide range of altitudes.11 Also, its communications system seemed to be working as well as it could under the handicap of being in the wrong orbit. Ultimately, as with the West Ford dipoles, the pressure of solar radiation caused the perigee of LES-4's orbit to descend into the upper atmosphere, and it burned up. Lincoln Laboratory's accomplishments in SHF space communications opened up a part of the electromagnetic spectrum that remains heavily used today. In fact, succeeding  generations of SHF satellites now form the space segment of the Defense Satellite Communications System (DSCS). Although LES-1, -2, and -4 showed the capabilities of SHF for reliable communications between fairly massive terminals, these technologies were not immediately available to small tactical units, such as vehicles, ships, aircraft, and specialized ground troops, all of which needed direct, dependable communications. Only a large command-post airplane or a sizable ship could be equipped with an SHF terminal capable of working with the DSCS satellites in orbit or those planned for the immediate future. Moreover, because high levels of SHF radio power could not be generated in the satellites, the downlink continued to limit system performance. Each terminal's antenna aperture had to be large enough to capture the downlink signal, and the price paid for a large antenna aperture was a narrow antenna beam that had to be pointed directly toward the satellite. Small tactical units, especially those in motion, could not accommodate such an antenna system. Communications links at much lower frequencies in the military UHF (ultrahigh-frequency) band (225 to 400 megahertz) solved the downlink problem. Solid-state circuits could generate substantial amounts of UHF power in a satellite.12 A relatively uncomplicated low-gain terminal antenna could provide a broad beam, thereby simplifying the task of pointing an antenna in the direction of the satellite, as well as a sizable aperture. Such antennas were particularly appealing for aircraft.13 UHF terminals also promised to be comparatively simple and inexpensive, and they could be produced in large numbers. The feasibility of satellite communications at longer wavelengths was demonstrated at VHF by Hughes Aircraft Company on 8 May 1964. The company used teletype-rate signaling (60 words per minute) through the Syncom 2 satellite from one ground terminal to another nearby.14 On 27 January 1965, teletype-rate satellite communication to and from an airplane in flight was demonstrated by using the Syncom 3 satellite, operating in the same mode as Syncom 2, and a ground terminal at Camp Parks, California.15 NASA's ATS-1 satellite, launched in December 1966, also participated in experiments of this sort. In 1965, the Department of Defense established Tri-Service Program 591 (Tactical Satellite Communications) to enable the Army, Navy, and Air Force to evaluate the potential usefulness of satellite communications in the military UHF band. Lincoln Laboratory was chosen to provide the satellites essential to the test program. LES-5 was to be built and launched as soon as possible; LES-6 would incorporate improvements on LES-5 and would be launched a year later. The three military services would procure test terminals that would work with LES-5 and -6 and would arrange for their installation in ships and aircraft. Lincoln Laboratory carried out two programs to measure the characteristics of the UHF environment. In the first program, receiving equipment was installed in aircraft and flown over representative cities and varied terrains, and the ambient radio noise was measured.16 In the second program, propagation phenomena between satellites and airborne terminals were examined. For this second program, LES-3 was built in haste, using technology from LES-1, -2, and -4, and was launched along with LES-4 on 21 December 1965. LES-3 17 was essentially an orbiting signal generator, emitting a signal near 233 megahertz.18 Given the degree of smoothness of the planet's surface relative to the one-meter wavelength of 300 megahertz (the middle of the military UHF band), much of its surface is mirrorlike. As a result, electromagnetic waves could be propagated between the satellite and the airborne terminal by more than one path. By knowing the likely parameters of the signal delays, the communications system designers were able to construct modulation and demodulation circuits that would not be confounded by multipath-propagation effects. LES-6 and the Hughes-built UHF/SHF TACSAT 21 (launched 9 February 1969) placed substantial communications resources in geostationary orbit, and the Department of Defense procured large quantities of UHF terminals. Because more than two satellites were needed for worldwide coverage, a series of satellites, including Gapfiller  (MARISAT),22 FLTSAT (U.S. Air Force satellite communications),23 and LEASAT,24 were launched. A new series, UHF Follow-On (UFO) satellites, is now under development. Use of the UHF spectrum for military satellite communications is by no means limited to the Pentagon. The Soviet Union has announced a series of Volna ("Wave") satellites that incorporate UHF uplinks and downlinks,25 and the United Kingdom has included UHF provisions in its series of Skynet 4 satellites, the first of which was launched on 10 December 1988.26 Although it is very difficult to defend a communications satellite with a UHF uplink against a determined jamming attack, the relative simplicity and comparative cheapness of UHF military satellite communications terminals make this part of the spectrum highly attractive, and it is likely to remain in use for a long time. LES-1, -2, and -4 showed that the SHF band could provide reliable communications within certain limitations. The antenna systems on these satellites were small in terms of wavelength, and their beams were much larger than Earth coverage (which is about 18 degrees from synchronous altitude). The next level of sophistication in SHF space communications was a satellite antenna system with a mechanically pointable, less-than-Earth-coverage beam. 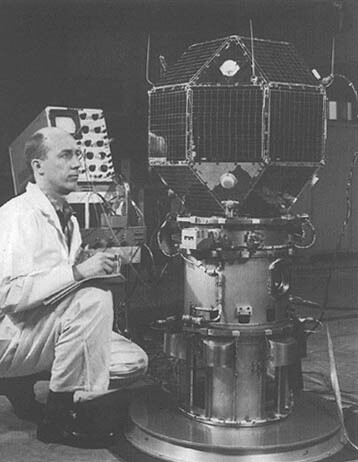 This advancement was achieved through the governmental procurement of communications satellites, such as the second generation of the DSCS satellites (the TRW DSCS II series).27 Lincoln Laboratory undertook the task of developing and demonstrating, in orbit, an antenna system that could allow satellite operators to aim the transmitting (downlink) power to receivers and simultaneously reduce the receiving (uplink) sensitivity in directions that might include sources of jamming or other interference. Such an antenna system can be built in two ways. In the phased-array approach, many separate transmit and/or receive modules (each of which has a beam width much larger than Earth coverage) are controlled individually in amplitude and phase, so that the sum of their signals--a result of constructive and destructive interference--approximates the desired transmitting or receiving antenna pattern covering the Earth. In the multiple-beam-antenna approach, many separate antenna feeds form a dense set of narrow pencil beams covering the Earth. The signals from this collection of beams are adjusted in amplitude and phase ("weighted") and combined to approximate the desired antenna pattern. Each approach has its merits and shortcomings, and the appropriate choice depends on the application. Lincoln Laboratory began a program to demonstrate, in orbit, a nineteen-beam (multiple-beam) antenna for reception at SHF. An Earth-coverage horn was to be used for the transmission. The thirty-inch-diameter (seventy-six-centimeter-diameter) aperture of the receiving antenna yielded a nominal three-degree resolution throughout the cone subtended by the Earth from geosynchronous-satellite altitude. The ground control terminal  was to calculate the weights for the individual beams to approximate the desired antenna pattern and to transmit the weights to the satellite by telecommand. By early 1970, it became apparent that LES-7 was ahead of its time. Because there was not enough Pentagon support for the mission, the funding required for the satellite's development, launch, and evaluation in orbit was not available. With considerable regret, Lincoln Laboratory put aside the LES-7 flight program, but it developed the critical multiple-beam-antenna technology "on the bench" and at an antenna test range.29 In time, the multiple-beam-antenna concept was applied to the third generation of the DSCS satellites. Each General Electric-built DSCS III carries three multiple-beam antennas: two nineteen-beam SHF antennas for transmission and one sixty-one-beam SHF antenna for reception. Lincoln Laboratory developed and built for the Department of Defense a pair of experimental communications satellites, LES-8 and -9, designed to operate in coplanar, inclined, circular, geosynchronous orbits and to communicate with each other via intersatellite links (cross-links), as well as with fixed and mobile terminals.30 Uplinks, downlinks, and intersatellite links at extremely high frequency (EHF) augmented the military UHF band. The EHF band held out the promise of abundant band width to accommodate many simultaneous users and spread-spectrum systems of modulation and demodulation for anti-jamming communications links. For reasons of convenience, operating frequencies in the Ka-band (thirty-six to thirty-eight gigahertz) were selected. The LES-8 and -9 intersatellite links successfully addressed the key technical problems that confront the implementation of satellite-to-satellite communications.33 LES-8 and -9 were launched together on 14 March 1978 aboard a Titan IIIC booster. Their launch was tailored to suit the companion Naval Research Laboratory Solrad IIa and Solrad IIb satellites and to facilitate the evaluation of specialized gyroscopes designed by the Charles Stark Draper Laboratory that LES-8 and -9 carried as flight experiments.34 LES-8 and -9 are powered by radioisotope thermoelectric generators (RTGs) and have no solar cells or batteries. The design of the RTGs had to assure their physical integrity in the event of a launch failure, so that the potential environmental hazard would be acceptable. During compatibility tests and preparations for launch, Lincoln Laboratory had to develop special procedures and pay scrupulous attention to health factors to ensure that workers would not be overexposed to particle radiation.35 The RTGs were well worth the effort. The compatibility of these rugged power sources with complex signal-processing circuitry has been well established. These RTGs are similar to the ones that power the Voyager spacecraft, which have been exploring the outer planets and beyond since 1977. LES-8 and -9 represent the high-water mark to date of Lincoln Laboratory's program in space communications. In addition to their complex communications system, these satellites have systems and subsystems for housekeeping functions, including attitude control,36 onboard (secondary) propulsion,37 telemetry,38 and telecommand. Lincoln  Laboratory continues to be responsible for the upkeep of LES-8 and -9. The Lincoln Experimental Satellite Operations Center operates and maintains these satellites, and it will continue to serve them as long as they remain useful.39 The technologies of onboard signal processing and of EHF transmission and reception, successfully demonstrated in the LES-8 and -9 Joint Test Program, have been incorporated in subsequent military satellite communications procurements. The single-channel transponders on the DSCS III satellites and the Milstar communications system itself (see below) have flowed directly from LES-8 and -9. Following the launch of LES-8 and -9 in 1976, Lincoln Laboratory addressed the problem of providing affordable anti-jamming communications to many small, mobile users. LES-8 and -9 and their associated terminals demonstrated that UHF and EHF communications systems could be cross-banded in signal-processing satellites and serve the needs of a limited number of small, mobile terminals. It was tempting to try to extend the approach to meet the needs of a large number of users, because the relative simplicity and cheapness of UHF terminals made that part of the spectrum attractive. Unfortunately, the military UHF band (225 to 400 megahertz) does not have enough available band width to provide the required levels of anti-jamming protection, and the application of adaptive nulling, an anti-jamming technique, was not enough to overcome this handicap.40 Therefore, under Lincoln Laboratory's new approach, all anti-jamming space communications links were assigned to the EHF band. The arguments for and against EHF are well known.41 The use of the EHF bands can overcome the frequency congestion that affects both civilian and military systems at lower frequencies. However, the major advantage to military users is that EHF also supplies the band widths necessary to implement robust jam-proof systems based on spread-spectrum technologies. By using advanced spread-spectrum and other techniques, including extensive onboard signal processing, a satellite of modest size can serve large numbers of small mobile users simultaneously with highly jam-resistant communications channels. The probability that covert transmissions from terminals wishing to remain unnoticed will be intercepted is also reduced at EHF. On the negative side, the effects of rain attenuation on EHF links require that the minimum elevation angle of the satellite relative to the terminal must be significantly higher than for lower frequency systems. In consultation with its sponsors, Lincoln Laboratory conceived a "strawman" EHF system and built a test-bed satellite with terminal hardware that served as the focus for the in-house technology development program. The groundwork for this EHF system concept  was laid during the successful development and demonstration of the Ka-band components, subsystems, and systems in LES-8 and -9. The essential features of the strawman EHF system were demonstrated on the bench at Lincoln Laboratory in 1980 and 1981 in the combined operation of the test-bed satellite with its test-bed terminal. Subsequently, the EHF system concept and the associated technologies in development at Lincoln Laboratory served as a point of departure for thinking about EHF systems within the Department of Defense military satellite communications community. In December 1981, the Pentagon decided to go ahead with a new enterprise, Milstar (the Military Strategic Tactical and Relay satellite), which incorporated many technical features of Lincoln Laboratory's strawman EHF system in its own system and in its Common Transmission Format. Lincoln Laboratory was asked to support Milstar development by building two Air Force communications satellite (FLTSAT) EHF Packages (FEPs). The communications capabilities of an FEP, when installed on TRW's Air Force UHF/SHF communications satellite, are a subset of those of a full Milstar satellite payload.42 The first FEP was integrated with FLTSAT-7, which was launched on 4 December 1986; the second was launched in 1989 as part of FLTSAT-8. The electronics and antenna assemblies of each FEP were built by Lincoln Laboratory under very tight power (305 watts) and mass (111 kilograms) constraints, so that they would be compatible with the existing Air Force satellite design. The FEP also has facilitated the early operational test and evaluation of the Milstar EHF/SHF terminals being developed by the Army, Navy, and Air Force. The complexity of an FEP communications system is far greater than that of the LES-8 or -9 satellites, even though the FEP has fewer parts. Integrated circuits in the early 1980s, when the FEP design choices were made, were more sophisticated than when LES-8 and -9 were designed in the early 1970s. During the FEP program, Lincoln Laboratory concentrated on the challenging technologies required for the FEP, taking advantage of the satellite-bus technologies already developed and proven in space by TRW's series of Air Force satellites. It has been gratifying that the FEP aboard FLTSAT-7 arrived safely in orbit and has worked well since launch. While the success of the FEP program speaks well for Lincoln Laboratory's approach to implementation and quality assurance in building reliable spacecraft, some of the success of Lincoln Laboratory's program in space communications has to be attributed to plain luck. Consider the case of the FEP carried by FLTSAT-7. Although FLTSAT-6 carried no FEP, FLTSAT-7 and -8 each carried one. The sponsor decided to juggle the launch schedule and interchange FLTSAT-7 and -6 to get an EHF package into orbit as early as possible. As a result, FLTSAT-7 was launched on 4 December 1986, and FLTSAT-6 followed on 26 March 1987 during a storm. Lightning struck the Atlas/Centaur booster. After the rocket engine noise ceased, and a series of muffled explosions occurred aloft, one of the authors of this chapter, who was at Cape Canaveral at the time, said to himself: "There but for the grace of God and the United States Navy went the first FEP." In another Milstar-related activity, Lincoln Laboratory designed and built the Single-Channel Objective Tactical Terminal (SCOTT), which was the advanced model of the Army's Milstar EHF/SHF terminal. In 1983, Army personnel successfully tested this terminal, mounted in a tracked military vehicle, against a satellite simulator in the field. The Army's production version of SCOTT has many of the features that were first demonstrated in Lincoln Laboratory's development model. As an outgrowth of the SCOTT work, Lincoln Laboratory conducted a feasibility study in 1983 that resulted in a conceptual design for a human-portable, Milstar-compatible EHF/SHF terminal. 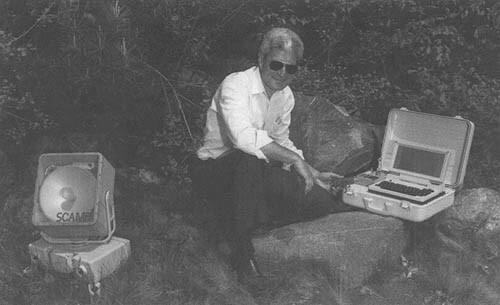 The development of the Single-Channel Advanced Milstar Portable (SCAMP) terminal was completed shortly after the launch of the first FEP, and it has operated successfully with the FEP. There are numerous diverse needs for limited-capability terminals of this class, which offer most of the advantages of Milstar communications without the full range of options. The success of optical communications for some terrestrial applications is undeniable. Laser and fiber optic technologies have brought about cables that seriously compete with communications satellites. However, optical space communications has been the "wave of the future" for many years. The advent of the laser, with its promise of coherent radiation across the transmitting apertures and correspondingly fine, high-gain antenna beams, has led to very encouraging link-performance calculations. To the best of the authors' knowledge, however, no one has yet demonstrated a nontrivial optical intersatellite link in space. ....in solid-state laser-diode technology was inadequate for a flight experiment and that the project's resources could not support an optical link. Progress in available components, coupled with new insights in system design, has since made it attractive to resume work in this area, often called "LASERCOM." Lincoln Laboratory is now developing a technology base for high-data-rate intersatellite links that could be realized with small-aperture, lightweight, low-power optoelectronic packages. The approach taken uses solid-state laser diodes and silicon-diode detectors operating in a heterodyne mode.44 Modulated continuous-wave transmission and heterodyne detection will be combined in the system design to provide communications significantly superior to the more commonly used systems based on pulsed transmission and direct energy detection (commonly known as the photon-bucket approach). Although Lincoln Laboratory began to prepare in 1985 for a demonstration of heterodyne LASERCOM technology in orbit, program constraints have ruled it out for the present. Lincoln Laboratory is now building an engineering model of a complete heterodyne LASERCOM system, which will address all critical technological areas and issues. When the world is ready for LASERCOM, the technology will be available. The next goal for reliable military satellite communications systems is the extension to high-data-rate applications of the robust, jam-resistant technologies for low-data-rate applications that FEP has demonstrated. Considering the large band widths that will be required, these new systems will most likely be implemented at EHF, at least for the uplinks and downlinks. The effects of bad weather, even clouds, on optical links between satellites and ground terminals seem certain to rule out LASERCOM for applications in which consistent link availability is important. However, optical links between satellites and airborne platforms flying above the weather may meet specific military needs. The technology of radio intersatellite links has been amply demonstrated in orbit by LES-8 and -9 and by NASA's Tracking and Data Relay Satellite System.45 It is only a matter of time--and of continued support--until LASERCOM intersatellite links are similarly demonstrated. Intersatellite link technologies have not yet found civilian application. The Intelsat 6 series of communications satellites, the first of which was launched in late 1991, was designed well after the LES-8 and -9 intersatellite links had been demonstrated in orbit. However, it was not found economically justifiable to include intersatellite links in the Intelsat 6 satellites, nor have such links appeared in successive generations of these birds. Nevertheless, the time for civilian intersatellite links will come. 1. The unabridged version of this paper originally appeared as William W. Ward and Franklin W. Floyd, "Thirty Years of Research and Development in Space Communications at Lincoln Laboratory," The Lincoln Laboratory Journal 2(1) (1989): 5-34. The authors are indebted to many people inside and outside Lincoln Laboratory for their assistance in the preparation of this history of Lincoln Laboratory's space communications program and are proud to have had the opportunity to chronicle their accomplishments. The authors especially acknowledge the Lincoln Laboratory Library--and the Archives Department in particular. 2. For background on the program, see "Project West Ford" in Compendium of Communication and Broadcast Satellites, 1958 to 1980 (New York: Institute of Electric and Electronic Engineers (IEEE), 1981), pp. 299-302; Donald H. Martin, "West Ford," in Communication Satellites 1959-1988 (El Segundo, CA: Aerospace Corporation, 1988), pp. 8-9. 3. "Project West Ford Issue," Proceedings of the IEEE 52 (1964): 449-606. 4. Petr Beckmann, Eco-Hysterics and the Technophobes (Boulder, CO: Golem Press, 1973), pp. 91-92. 5. Irwin I. Shapiro, "Last of the West Ford Dipoles," Science 154 (1966): 1445. 6. Walter E. Morrow, Jr., "The Lincoln Experimental Communications Satellite and Terminal Program," AIAA 2nd Communications Satellite Systems Conference, San Francisco, 8-10 April 1968, AIAA Paper 68-429 (New York: American Institute of Aeronautics and Astronautics, 1968); Herbert Sherman, Donald C. MacLellan, and Philip Waldron, The Lincoln Satellite Technology Program through 1 January 1968: An Annotated Bibliography, Lincoln Laboratory Technical Report 450 (Lexington, MA: Lincoln Laboratory, 12 June 1968), DTIC #AD-679559. 7. "IDCSP" in Compendium of Communication and Broadcast Satellites, pp. 167-70; Martin, "West Ford," pp. 75-76. 8. Herbert Sherman, Donald C. MacLellan, R.M. Lerner, and Philip Waldron, "Lincoln Experimental Satellite Program (LES-1, -2, -3, -4)," Journal of Spacecraft and Rockets 4 (1967): 1448-52; "LES-1 or -2 (Identical)" in Compendium of Communication and Broadcast Satellites, pp. 175-77. 9. John W. Craig, et al., The Lincoln Experimental Terminal, Lincoln Laboratory Technical Report 431 (Lexington, MA: Lincoln Laboratory, 21 March 1967), DTIC #AD-661577. 10. Sherman, MacLellan, Lerner, and Waldron, "Lincoln Experimental Satellite Program (LES-1, -2, -3, -4)"; "LES-4," in Compendium of Communication and Broadcast Satellites, pp. 183-85; Martin, "West Ford," pp. 14-15; J. Bruce Rankin, Mark E. Devane, and Milton L. Rosenthal, "Multi-function Single-Package Antenna System for Spin-Stabilized Near-Synchronous Satellite," IEEE Transactions on Antennas and Propagation AP-17 (1969): 435-42. 11. Alan G. Stanley and Jean L. Ryan, Charged-Particle Radiation Environment in Synchronous Orbit, Lincoln Laboratory Technical Report 443 (Lexington, MA: Lincoln Laboratory, 15 May 1968), DTIC #AD-677284. 12. David M. Snider, "A Theoretical Analysis and Experimental Confirmation of the Optimally Loaded and Over-Driven RF Power Amplifier," IEEE Transactions on Electron Devices ED-14 (1967): 851-57; Alvise Braga-Illa and David M. Snider, "Transmitted-Power Maximization in Communication Satellites," Journal of Spacecraft and Rockets 6 (1969): 173-77. 13. C.A. Lindberg, "A Shallow-Cavity UHF Crossed-Slot Antenna," IEEE Transactions on Antennas and Propagation AP-17 (1969): 558-63. 14. L.A. Greenbaum and R.A. Boucher, "VHF Teletype Demonstrations," Hughes Aircraft Co., Ref. 2230.3/152 (23 June 1964), NASA-CR-57989 (contractor's report). 15. Allen L. Johnson, "Two Hundred Years of Airborne Communications," Aerospace Historian 31 (1984): 185-93; VHF Aircraft Satellite Relay--Final Report of Flight Test, Report No. 481-1016-958 (Baltimore: Bendix Radio Division, April 1965). 16. George Ploussios, "Electromagnetic Noise Environment in the 200 MHz to 400 MHz Band on Board Aircraft," Proceedings of the IEEE 54 (1966): 2017-19; George Ploussios, "City Noise and Its Effect upon Airborne Antenna Noise Temperatures at UHF," IEEE Transactions on Aerospace and Electronic Systems AES-4 (1968): 41-51; George Ploussios, Noise Temperatures of Airborne Antennas at UHF, Lincoln Laboratory Technical Note 1966-59 (Lexington, MA: Lincoln Laboratory, 6 December 1966), DTIC #AD-644829. 17. Sherman, MacLellan, Lerner, and Waldron, "Lincoln Experimental Satellite Program (LES-1, -2, -3, -4)"; "LES 3" in Compendium of Communication and Broadcast Satellites, pp. 179-81. 18. Kenneth L. Jordan, Jr., "Measurement of Multipath Effects in a Satellite/Aircraft UHF Link," Proceedings of the IEEE 55 (1967): 1117-18. 19. William W. Ward and Burt E. Nichols, Lincoln Experimental Satellite-5 (LES-5) Transponder Performance in Orbit, Lincoln Laboratory Technical Note 1968-18 (Lexington, MA: Lincoln Laboratory, 1 November 1968), DTIC #AD-686421; Donald C. MacLellan, Hugh A. MacDonald, Philip Waldron, and Herbert Sherman, "Lincoln Experimental Satellites 5 and 6," in Nathaniel E. Feldman and Charles M. Kelly, eds., Progress in Astronautics and Aeronautics, Vol. 26, Communication Satellites for the Seventies: Systems (Cambridge, MA: MIT Press, 1971), pp. 375-98; "LES-5" and "LES-6" in Compendium of Communication and Broadcast Satellites, pp. 187-93; William L. Black, Bradford Howland, and Edward A. Vrablik, "An Electromagnetic Attitude-Control System for a Synchronous Satellite," Journal of Spacecraft and Rockets 6 (1969): 795-98; Milton L. Rosenthal, Mark E. Devane, and Bernard F. LaPage, "VHF Antenna Systems for Spin-Stabilized Satellites," IEEE Transactions on Antennas and Propagation AP-17 (1969): 443-51. 20. Irwin L. Lebow, Kenneth L. Jordan, Jr., and Paul R. Drouilhet, Jr., "Satellite Communications to Mobile Platforms," Proceedings of the IEEE 59 (1971): 139-59. 21. "TACSAT" in Compendium of Communication and Broadcast Satellites, pp. 225-27; Martin, "West Ford," pp. 77-78. 22. "MARISAT" in Compendium of Communication and Broadcast Satellites, pp. 51-53; Martin, "West Ford," p. 84. 23. "FLTSATCOM" in Compendium of Communication and Broadcast Satellites, pp. 159-61; Martin, "West Ford," pp. 87-90. 24. "LEASAT" in Compendium of Communication and Broadcast Satellites, pp. 171-73; Martin, "West Ford," pp. 93-95. 25. "Volna 1 through 7 Series" in Compendium of Communication and Broadcast Satellites, pp. 87-89; Martin, "West Ford," pp. 104-05. 26. "Skynet-4" in Martin, "West Ford," p. 95. 27. "DSCS-II" in Compendium of Communication and Broadcast Satellites, pp. 151-53; Martin, "West Ford," pp. 80-82. 28. "LES 7" in Compendium of Communication and Broadcast Satellites, pp. 195-97; Martin, "West Ford," p. 17. 29. Andre R. Dion and Leon J. Ricardi, "A Variable-Coverage Satellite Antenna System," Proceedings of the IEEE 59 (1971): 252-62. 30. Frederick W. Sarles, Jr., Leonard W. Bowles, L.P. Farnsworth, and Philip Waldron, "The Lincoln Experimental Satellites LES-8 and LES-9," IEEE Electronics and Aerospace Systems Convention (EASCON), Arlington, Va., 1977, Eascon-77 Record, p. 21-1A, IEEE no. 77CH1255-9; "LES 8 and 9" in Compendium of Communication and Broadcast Satellites, pp. 199-206; Martin, "West Ford," pp. 31-33. 31. F. John Solman, Carl D. Berglund, Richard W. Chick, and Brian J. Clifton, "The K Systems of the Lincoln Experimental Satellites LES-8 and LES-9," AIAA Paper 78-562, A Collection of Technical Papers: AIAA 7th Communications Satellite Systems Conference, San Diego, California, April 24-27, 1978 (New York: AIAA, 1978), p. 208-15. This paper contains a bibliography of other papers on K-band technology for LES-8 and -9. It also appeared in Journal of Spacecraft and Rockets 16 (1979): 181-86. 32. L.J. Collins, L.R. Jones, David R. McElroy, David A. Siegel, William W. Ward, and David K. Willim, "LES-8/9 Communications-System Test Results," AIAA Paper 78-599, A Collection of Technical Papers: AIAA 7th Communications Satellite Systems Conference, San Diego, California, April 24-27, 1978 (New York: AIAA, 1978), p. 471-78. 33. David M. Snider and David B. Coomber, "Satellite-to-Satellite Data Transfer and Control," AIAA Paper 78-596, A Collection of Technical Papers: AIAA 7th Communications Satellite Systems Conference, San Diego, California, April 24-27, 1978 (New York: AIAA, 1978), p. 457; William W. Ward, David M. Snider, and Ronald F. Bauer, "A Review of Seven Years of Orbital Service by the LES-8/9 EHF Intersatellite Links," IEEE International Conference on Communications: Integrating Communication for World Progress, Boston, MA, 19-22 June 1983 (Piscataway, NJ: IEEE, 1983), pp. E1.1.1-10. 34. Lawrence J. Freier, R.N. Masters, J.A. DeFrancesco, R.A. Harris, G.J. Blakemore, and R.A. Jeffery, Third-Generation Gyro System Final Report, Report R-843 1, Charles Stark Draper Laboratory, Inc., February 1975. 35. C.E. Kelly and C.W. Whitmore, "Performance of the Multi-Hundred-Watt Radioisotope Thermoelectric Generator (MHW/RTG) Power Source for the LES-8/9 Satellites," AIAA Paper 78-534, A Collection of Technical Papers: AIAA 7th Communications Satellite Systems Conference, San Diego, California, April 24-27, 1978 (New York: AIAA, 1978), p. 728-35. 36. Franklin W. Floyd, Carl H. Much, Norval P. Smith, Joseph R. Vernau, and J.P. Woods, "Flight Performance of the LES-8/9 Three-Axis Attitude-Control System," AIAA Paper 80-0501, A Collection of Technical Papers: AIAA 8th Communications Satellite Systems Conference, Orlando, FL, 20-24 April 1980 (New York: AIAA, 1980), p. 159. 37. Carl K. Much and Franklin W. Floyd, Jr., "The Cold-Ammonia Propulsion System for the Lincoln Experimental Satellites, LES-8 and -9," Proceedings of the JANNAF Propulsion Meeting, Atlanta, GA, 7-9 December 1976, Vol. 3 (Laurel, MD: Chemical Propulsion Information Agency and Johns Hopkins University, Applied Physics Laboratory, 1976), p. 491. 38. Frederick W. Sarles, Jr., John H. Helfrich, Paul F. McKenzie, and James K. Roberge, "The LES-8/9 Telemetry System: Part I, Flight-System Design and Performance," Record of the International Telemetry Conference 78, Los Angeles, 14-16 November 1978, p. 645; John H. Helfrich, Atle M. Gjelsvik, Charles M. Rader, Daniel C. Rogers, and C.E. Small, "The LES-8/9 Telemetry System: Part II. Ground-Terminal Design and Performance," Ibid., p. 657. 39. William W. Ward, Developing, Testing, and Operating Lincoln Experimental Satellites 8 and 9 (LES-8/9), Lincoln Laboratory Technical Note 1979-3 (Lexington, MA: Lincoln Laboratory, 16 January 1979), DTIC #AD-AO69095/8. 40. Joseph T. Mayhan, "Adaptive Antenna Design Considerations for Satellite Communication Antennas," IEE Proceedings: Microwaves, Optics and Antennas 130, Part H (1983): 98-108; Joseph T. Mayhan and Franklin W. Floyd, Factors Affecting the Performance of Adaptive Antenna Systems and Some Evaluation Techniques, Lincoln Laboratory Technical Note 1979-14 (Lexington, MA: Lincoln Laboratory, 9 August 1979), DTIC #AD-AO81711/4. 41. William C. Cummings, Pravin C. Jain, and Leon J. Ricardi, "Fundamental Performance Characteristics That Influence EHF MILSATCOM Systems," IEEE Transactions on Communications COM-27 (1979): 1423-35; C.J. Waylan and G.M. Yowell, "Considerations for Future Navy Satellite Communications," IEEE Electronics and Aerospace Systems Convention (EASCON), Arlington, VA, 1979, EASCON-79 Record, p. 623-27, IEEE No. 79CH1476-1. 42. David R. McElroy, "The FEP Communications System," AIAA Paper 88-0824, A Collection of Technical Papers: AIAA 12th International Communications Satellite Systems Conference, Arlington, VA, 13-17 March 1988 (New York: AIAA, 1988), p. 395. 43. Marilyn D. Semprucci, "The First Switchboard in the Sky: An Autonomous Satellite-Based Access/Resource Controller," Lincoln Laboratory Journal 1 (1988): 5-18. 44. Vincent W.S. Chan, "Space Coherent Optical Communication Systems: An Introduction," Journal of Lightwave Technology LT-5 (1987): 633-37; Vincent W.S. Chan, "Intersatellite Optical Heterodyne Communications Systems," Lincoln Laboratory Journal 1 (1988): 169-86. 45. "TDRSS/Advanced WESTAR" in Compendium of Communication and Broadcast Satellites, pp. 139-47; Martin, "West Ford," pp. 152-56. 46. Arthur C. Clarke, "The Social Consequences of Communications Satellites," paper presented at the 12th International Astronautical Congress, Washington, DC, 1961, and published in Arthur C. Clarke, Voices from the Sky: Previews of the Coming Space Age (New York: Harper & Row, 1965), p. 139.